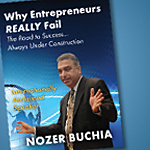 SPEAKER: Nozer Buchia, referred to as "Mr. Motivator," is an internationally-acclaimed motivational, inspiration and keynote speaker and author of Why Entrepreneurs Really Fail! He is known as a "speaker’s-speaker" due to his dynamic inimitable style of humor and delivery, and his practical approach to any situation. For more information regarding Nozer and his outstanding work, please visit his web site by: Clicking Here! TOPIC: Why Entrepreneurs Really Fail!